For those that are heavily into gaming on their PC, it’s a given that you’ll be wanting to pick up your own gaming mouse. However, it’s not as simple as just trotting over to Amazon to pick up a mouse and get it delivered. There are actually a lot of factors that have to be examined before you decide to pick up a mouse and it’s important that they tick as many boxes as possible. One area that many people fall victim to is the fact that you need to spend more money to get the best mouse out there. This isn’t actually the case and it is possible to get an excellent gaming mouse on a budget. Again though, not all budget gaming mice are created equal and it is important that you don’t fall into the trap of buying a gaming mouse that is cheap, but is of such poor quality that you’ll need to replace it very quickly. For any gaming mouse, the key areas that you should be looking for are customisation in terms of keys, changeable DPI of the mouse, a wired connection (as a wireless mouse may caused a slight input lag) as well as exceptional build quality. The weight can also be a factor for some depending on the genre of game that they are playing since if they are competitive players, they may be used to slightly heavier or lighter mice. After a lot of testing, there are two stand out gaming mice for less than the price of the latest video game. These are from Havit and Logitech respectively. Havit’s offering is an excellent mouse at an affordable price range. It has been designed in such a way that it is perfect for those that play MMO’s extensively. This is due to the fact that there are 12 programmable buttons on the mouse itself. This makes it ideal for assigning various key presses to one of the programmable macro keys on the mouse. However this is also suitable for applications out with gaming, making it ideal for office tasks as well, or even in other programs such as Photoshop. These keys are programmable via the included DVD that comes with the mouse. With its graphical representation of the mouse, it is extremely easy to customise it to suit your needs. Moreover, the build quality of the mouse is excellent. It is just smaller than the infamous Microsoft Sidewinder X5 gaming mouse, making it ideal for those with larger hands. With regards to DPI, it offers a wide range. The DPI resolutions are 500,1000,1500,2000,4000,8000 and 12,000. These are interchangeable on the fly by pressing the dedicated buttons on the mouse, making it ideal to switch the resolution depending on your needs either mid game, or mid application. The mouse also changes colour depending on the DPI you have chosen which is another nice touch. Further, the cable itself is just shy of 2 metres (it comes in at 1.8 metres). This makes it ideal for those that are plugging a mouse into the back of their PC and need a lot of cable length to game comfortably. With other budget gaming mice, the cables are generally shorter and this can result in your actions being constricted due to this. It can also result in you pulling the mouse out of the PC if the cable is too short and you yank on it. The cable is also braided which will ensure that it lasts for a long time. Overall, this mouse is exceptional, especially at this price range and is a lot better than other brands that are charging a premium for their mice. If you would like to buy the Havit, you can get it from Amazon.com and Amazon.co.uk. This offering from Logtech offers the same maximum DPI of the Havit variant (12,000) and it also has the same overall size as well. It too has a wired connection to your PC making it ideal for intense and competitive gaming sessions, so much so that it is actually endorsed by Team Solomid who have made a big impact on the competitive gaming scene in League of Legengs, Counter Strike GO and also Warcraft. However, in comparison to the 12 programmable buttons on the Havit gaming mouse, the Logitech has 6 programmable buttons so this may be a deal breaker for some people. It does also have on the fly DPI switching for ease of access during various gaming scenarios which will help you keep the upper hand against your competitors. The G303 also has RGB lighting included in it, so you are able to customise your mouse to the way that matches your own personal style. The G303 is built to last with each key having a lifespan of at least 20 million clicks. Logitech have calculated that this equates to 10 hours of professional gaming each day for two years. Given the fact that many people don’t game for this duration, let alone every day it means that the mouse should last you for even longer. The G303 feels amazing in the hand and is easy to use in various genres of game, particularly in shooting games that require pinpoint precision. This, like the Havit, is highly recommended. 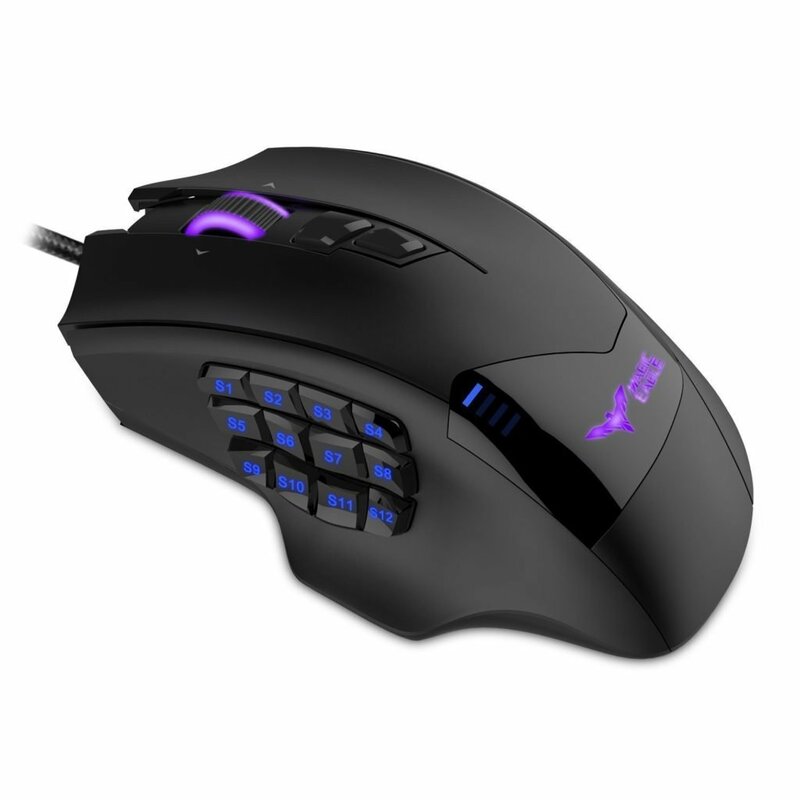 This might be a better option for those that prefer to purchase a more well known brand of mouse, and with Logitechs high quality and excellent customer service this is an ideal choice for your budget gaming mouse needs. You can purchase it from Amazon.com and Amazon.co.uk.